When it comes to dried fruit, cranberries do not top my list of favorites. I love raisins, prunes, dried apricots, dried peaches, and dried tart cherries any time of the year, but it’s rare to find a bag of dried cranberries in my pantry most of the time. However, when Thanksgiving rolls around, I start thinking cranberries and the dried ones inevitably start showing up in my green salads and baked goods and continue to do so through January. They add a festive pop of color and the flavor pairs beautifully with oranges, one of my favorite things to eat in the winter. I do use the fresh ones for holiday cranberry sauces and relishes, but I think dried cranberries are wonderful in cookies, muffins, scones, and green salads. Phil loves the combination of cranberries and white chocolate, so I decided to put them together in a cookie recipe for him. I had pecans on hand, so I added those as well. I thought orange zest would be perfect in these, but he asked me to leave it out. Luckily I didn’t listen to him, because I think the orange zest is what turned these into some of the best cookies I’ve ever made. The orange flavor isn’t overpowering, but it makes them smell so good and festive that I can’t imagine leaving it out. Basically, I wouldn’t change a thing about these cookies. The toasted pecans are perfect, and yes, I do think that the extra step of toasting them first is worth it. I also think the almond extract is necessary. 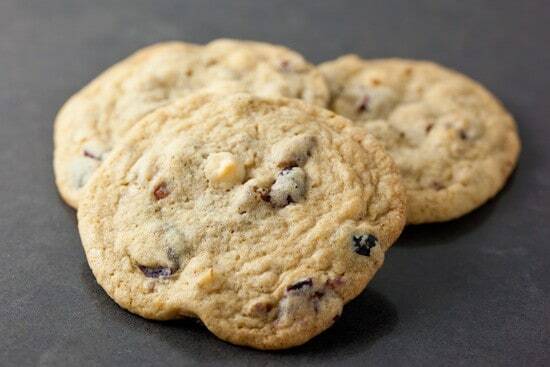 Yes, it can sometimes be overpowering, but the small amount used in combination with vanilla extract here is just enough to add a depth of flavor that you’ll notice without being able to pinpoint exactly what it is that’s making you want to shove more and more cookies in your face. I hope you enjoy them as much as we have! 1. Preheat oven to 350 degrees. Line baking sheets with parchment paper or silicone baking mats. 2. In a large mixing bowl, beat butter and sugars until creamy. 3. Add eggs, one at a time, beating well after each addition. Stir in extracts and orange zest. 4. In a separate bowl, whisk together flour, baking soda, and salt, then slowly beat in flour mixture until everything is well combined. By hand, stir in white chocolate chips, cranberries, and pecans. 5. Drop heaping spoonfuls of cookie dough (or use a cookie scoop – one of my favorite kitchen tools), spaced about 1 1/2 inches apart. Bake for 11-13 minutes, rotating the pan halfway through if your oven has hot spots. Yield: approximately 3 to 4 dozen 3 1/2-inch cookies. Recipe notes: *To toast pecans, spread them on a cookie sheet and bake in a preheated oven for 6-8 minutes (less if the nuts are in pieces rather than whole), or until they smell good and start to darken slightly. Let cool before chopping. These make a serious run for the coveted top spot on Phil's Favorite Cookies list (as seen on Late Night with David Letterman and the television show formerly known as Oprah). As you know, I am a classic Oatmeal Raisin guy, especially when it comes to a breakfast cookie, but these were absolutely delicious and I could see myself easily tearing up 8 or 10 of them over a glass of milk any time of the day. Really well done! (-:P.S. Steve said any time you'd like me to have a day off to just make him some of these and he'll make sure it happens. Oh my gosh, these sound soooooo good. I love the combination of cranberry, orange, and pecans... must try. 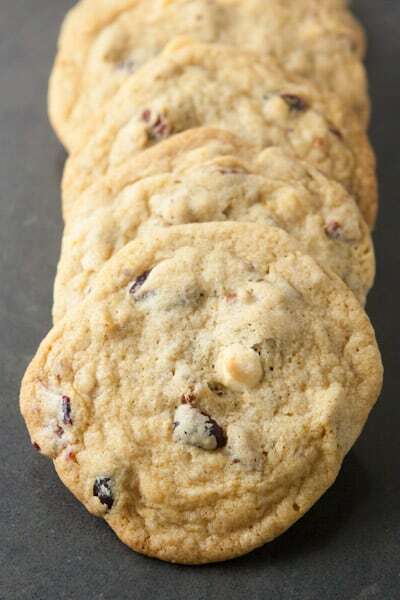 it's funny, I'm not a huge fan of cranberries but somehow I do love them combined with white chocolate and pecans in a cookie! yours look REALLY delicious. Phil told me about these last night, they look fantastic! Oh, and hello, love your blog! These cookies look so delicious! I can just imagine the aroma from the orange zest. I totally agree with you on pre-toasting the nuts! It seems like a small thing but makes a big difference. My husband and I made these yesterday and they are so good. I am so glad you did not leave out the orange rind. The orange and almond absolute make this cookie. I'm thinking about making these again and using regular or dark chocolate. Definitely a great cookie for the season. I highly recommend making these cookies! Sometimes I really wonder why I didn't come up with that same idea as good as these. Not my talent in coming up with recipes I guess. But i do love cooking and I can follow instructions to the letter. These came up real good. I know it's past the 'season' but I love cranberries anytime, so I thought I would direct you to another recipe you will likely love. Go to the Pampered Chef site, find their recipe link and search for Cranberry & White Chocolate Crescent Pastries. I made them and they are delish. I finally tried them in March of this year...just did not get time to do so during the holidays. I used pre-made crust, but I will make my own or try actual crescent roll dough next time. I did not care for the aftertaste of the pre-made crust. I made a double batch and would recommend the same for you if you are making for company. They have white choc, cranberries, orange zest and walnuts (toasted). Easy and fun, and a great appetizer or dessert (x2). I have a similar recipe and I LOVE it! I need to try this one out! A very good idea! Thank you. I love prunes, dried apricots, dried peaches, and dried tart cherries. We were looking for a cookie recipe with dried cranberries. After looking thru several, we chose this one. We bake lots of cookies at our house, and this is probably one of the best ever. This recipe is definitely a "keeper" and will be used any times. We did not have an orange, but used the zest of a Halo-loved the orange flavor. Thanks.